Registering as an ISO/MSP (Independent Sales Organization - Visa / Merchant Service Provider - MasterCard) is much more than simply filling out a membership application. The process required a review of our business practices, financial strength, and vision of the future. It should be noted that it is mandatory for every individual and company that promotes or provides MasterCard and Visa merchant accounts to be officially registered. This was instituted back in the 1970's as a way of weeding out unscrupulous sales practices that were rampant at that time. Unfortunately, even today, there are still some organizations and sales reps that fail to comply. Unregistered agents tend to be less informed, prone to make false representations, less diligent in providing valuable training and professional advice, and more likely to be less accountable should a problem develop. As you search for a merchant account on the Internet please be sure that you see the required ISO/MSP affiliation along with the sponsoring bank's name and city on the company's web site. This notice lets you know that you are doing business with a professional, similar to the MD after your physician's name or the CPA designation that your accounting professional proudly displays. Dealing with a registered professional goes a long way to insuring that we will have a mutually rewarding long-term professional relationship. 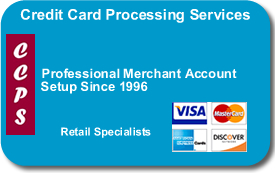 Credit Card Processing Services values our membership in the Electronic Transaction Association (ETA) which is the national association for credit card acquiring professionals. In addition, as a commitment to better serving our restaurant clients, we are members of the National Restaurant Association through our sister company Promo King.